The signature moment of Jarrod Lyle’s all-too-brief PGA Tour career was the hole-in-one he made at the 2011 Waste Management Phoenix Open. That joyous event will now be commemorated each year, thanks to a thoughtful gesture by tournament organisers. Lyle died last year at 36 after battling leukemia for nearly two decades. That’s when Waste Management Phoenix Open Tournament Director Chance Cozby began to put into motion a plan to honour Lyle, as well as the others who have made an ace at the famed 16th hole. Cozby got the idea after watching the shot repeatedly replayed and hearing broadcaster Jim Nantz mention how the hole-in-one was worth remembering. That pushed Cozby’s mind into action. 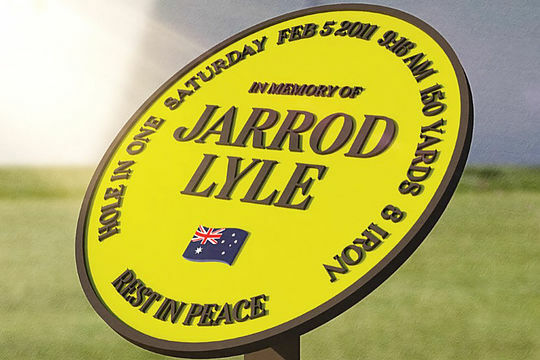 “Jim said he was surprised they hadn’t done anything on the 16th hole to commemorate his hole-in-one, and I started thinking about what we could do to honour Jarrod and celebrate him,” Cozby said. A temporary memorial will be placed at No. 16 during Saturday’s third round. There will be a replica of Lyle’s Titleist staff bag stuffed with replica clubs, including the 8-iron he used that morning. A yellow bucket hat, like the one Lyle wore later in his career, will be draped on top. “Every player is going to walk on the tee on Saturday and see that monument and see his bag with the yellow bucket hat, and they can all have a quick moment for their friend and his family and celebrate him,” Cozby said. A permanent marker will also be affixed on the tee to honour all those who have defied the odds—amplified by the pressure of 30,000 fans watching—by making a hole-in-one. There have only been nine made at the hole, among them by Hal Sutton, Steve Stricker and Tiger Woods. Lyle didn’t try to be cool in the moment. He raised both arms in triumph, high-fived playing partners Ben Martin and Troy Kelly and faced back toward the crazed gallery for additional adulation. He enjoyed the animated walk to the green, and when he picked the ball out of the cup, he gave the crowd near the green another hardy fist pump before he walked away. The remembrances continue this week outside Phoenix, where his most famous shot was struck. The memories aren’t likely to end there.